With a shocking start to episode four, “Human Pin Cushion,” we see Murrugun shoving skewers through his arm. 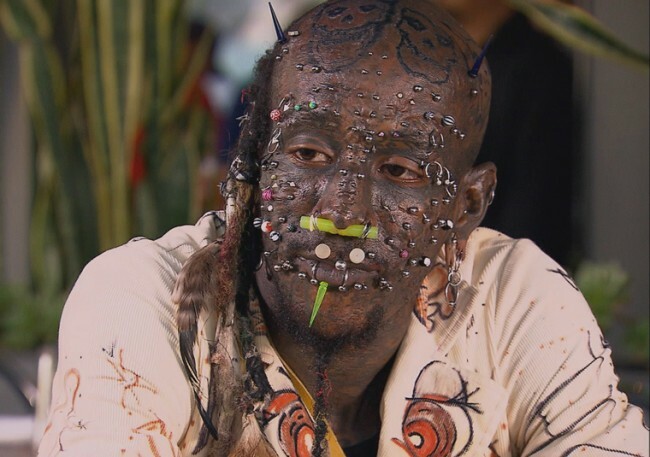 He has agreed to do the famous human pin cushion act for the Venice Beach Freakshow. This act goes back thousands of years where people would pierce themselves in multiple locations throughout their bodies without bleeding. Murrugun proposes to stick a skewer through his torso where it will exit out his back. Todd shows concern about Murrugun possibly getting hurt, but Murrugun is confident he can pull it off, stating that he’s performed transcendental meditation for over thirty five years. He says he has to work himself into a mantra and that he will then move his internal organs so they are not pierced. Todd recommends that he go to a doctor and gets this idea cleared, for safety’s sake. There’s some tension still between Murrugun and Morgue as they both agree to do the human pin cushion act, each in their own way. Murrugun is one of the last people who do this show without blood. Morgue, on the flip side, relishes pain and blood. He proposes using long hypodermic spinal needles to put into his face. The pain, he says, makes him feel alive. In fact, he reveals he used to have a phobia of needles. Morgue cured himself by eventually sticking thousands of needles into his body. The Creature gives us a little insight into the reason he has become so decorated. He says there have always been limits on African American skin in the tattoo industry. He wanted to break the boundary on African American males concerning tattoos and piercings. The Great Oh My was one of histories most incredibly tattooed men, one of the first to cover his body in tattoos, but maybe even more remarkably, Creature tattooed himself. Creature said his body tells his story, and his story can never be done. It turns out he has a five year old daughter, and he claims it’s been a hard road because the few times he has seen her, she’s been scared. His decision to modify his body has caused him to not have a relationship with his daughter. Todd, coming down from a Murrugun inspired health scare moment, is in full on Dr. Phil mode and counsels Creature about how important it is for him to see his daughter, at least for her sake. He plans to set up an arranged meeting between his daughter’s mother and him so that Creature can have a relationship with his daughter. Danielle, Todd’s wife, calls Creature’s ex-wife, Alyssa, and sets up a meeting between Alyssa and Creature. Todd and Danielle accompany Murrugun to the doctor in order to make sure that he’s safe performing his act. They x-ray him swallowing a sword. With the subsequent images, they prove that his sword goes down into his stomach. However, the doctor informs them that Murrugun’s plan to move his intestines out of the way so that he can safely puncture through his abdomen is impossible. It seems that Murrugun is still no convinced, though. Creature meets with his ex-wife who expresses surprise at his appearance, which has changed since she’s last seen him. She feels he’s chose his lifestyle over their daughter. Through their conversation we find out that Creature wasn’t the same tattooed, pierced man that he is today when they were married. Alyssa is visibly upset at his transformation. Creature gives her some clothing he decorated for his daughter. It’s a very emotional, bittersweet meeting and the two of them both laugh and cry. Now it’s time for the show. Todd calls the show from the sidewalk and the crowd comes inside to watch Morgue do the human pin cushion act. He takes surgical needles and pushes them through his forehead and even eyelids. A thin trickle of blood runs down his forehead, the red in contrast to his pale, white skin. He prompts the audience to chant, “Blood” and he proceeds to shove needles through both of his cheeks, leaving him not able to close his mouth. A small bead of blood shows up on his cheek when he pulls one out. Next, Murrugun shows the audience three skewers and takes off his shirt. He puts one through his upper arm, another in his mouth, under his tongue and through his lower jaw, and the next one he will be putting through his torso. They give him a few minutes to meditate and prepare, then he goes through with his original plan and pierces through his lower left abdomen. True to his word, there is no blood. Todd praises that Murrugun is a true mystic. Todd also says that these acts remind him that the body is a miracle. It truly is amazing. With acts like these, the crows continue to gather on the sidewalk out front of the Venice Beach Freakshow. What wonders await us for next Thursday? Posted by Amber Keller on Thursday, March 7th, 2013. Filed under Dark TV, Headline. You can follow any responses to this entry through the RSS 2.0. You can skip to the end and leave a response. Pinging is currently not allowed.